The Expedition 8 crew blasts off early Saturday aboard a Russian Soyuz rocket to keep the International Space Station staffed with full-time "caretakers" while construction of the orbiting lab remains suspended by NASA's grounded space shuttle fleet. 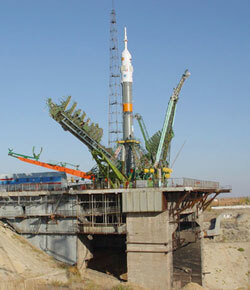 Launch from the Baikonur Cosmodrome in Central Asia is scheduled for 0538 GMT (1:38 a.m. EDT). The Soyuz TMA-3 capsule should settle into Earth orbit about nine minutes later, beginning its two-day chase to rendezvous with the station. Docking is expected around 0717 GMT (3:17 a.m. EDT) Monday as Expedition 8 arrives at the station to relieve the Expedition 7 crew after a half-year tour-of-duty in orbit. One of NASA's most seasoned astronauts, Michael Foale, is commander of the eighth space station crew. Russian cosmonaut Alexander Kaleri will serve as the Expedition 8 flight engineer and commander of the Soyuz during launch and landing. Spanish astronaut Pedro Duque of the European Space Agency will launch in the Soyuz craft's third seat for a brief visit to the station to run science experiments. He returns to Earth with the outgoing Expedition 7 crew after 10 days aloft. Expedition 7 commander Yuri Malenchenko and NASA science officer Ed Lu launched in April aboard the Russian Soyuz TMA-2 capsule to become the first "caretaker" crew on the station in the wake of Columbia's tragic loss in February. After 185 days in space, Expedition 7 will ride their Soyuz back to Kazakhstan, landing around 0236 GMT on October 28 (9:36 p.m. EST Oct. 27). Expedition 8 is scheduled to last 194 days, roughly the orbital lifespan of the Soyuz TMA-3 spacecraft. The capsule serves as the crew's only means to launch and return to Earth. Without shuttles traveling to and from the station, Russia's Soyuz is the sole means of furthering the continuous human presence in space that began with Expedition 1 three years ago. NASA says the next shuttle flight won't occur before September 2004. "Without the robust support that the Russians have provided in this time when the shuttles are grounded, we would be in serious trouble," said NASA astronaut Bill McArthur, the back-up commander of Expedition 8. "I think it is pretty sobering to imagine what we would be doing today following the Columbia tragedy if we couldn't rely on our international partners," he added. "It really proves that there were some people with pretty sharp vision 10-plus years ago when this international partnership started and when we started working with the Russians in particular." While shuttles are grounded to fix the external fuel tanks and develop thermal protection system inspection and repair techniques, assembly of the orbiting complex has been halted because NASA's spaceplanes serve as the only way to haul up the station's large trusses and modules. Eight additional shuttle flights are scheduled before the American section of the station is completed. Subsequent flights will loft other international modules and equipment. What's more, the shuttle provides the service of ferrying science experiments and hardware back to Earth. 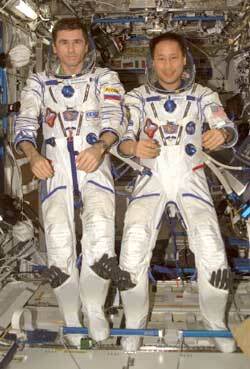 The cramped Soyuz leaves little room for transporting items to the ground. "(The station) is a vital and vibrant program even absent the shuttle right now. Although, clearly, for the station to realize its potential we just have to get the shuttle flying again so we can finish construction of the station and return to us the capability to bring back all this science that has been done on the station, to bring back the samples that are being collected up there. That is a capability that is unique to the shuttle," McArthur said. Throughout the Expedition 8 mission, Foale and Kaleri will be focused on maintaining the station's systems and keeping the complex safely in orbit. A science program is also planned to perform as much research as their time permits. Next February, a spacewalk outside the Russian segment of the station is scheduled to exchange external experiments and begin outfitting the Zvezda service module with equipment needed to support the European Automated Transfer Vehicles that will bring supplies to the station starting late next year. "The biggest goal for us as a crew...is to maintain a human presence onboard this international project, the International Space Station," Foale said. "Beyond that, we have goals that would maintain the space station, keep it in an operational condition, and carry out experiments that we are not only carrying with us -- and that's pretty few, actually -- and continue those that are on board already, and there are many of those." A self-described "addict" for spaceflight, Foale knows the risks of the business. He was living aboard the Russian space station Mir in 1997 when an unmanned cargo freighter slammed into the complex, causing one module to depressurize. "You have to take two positions here. One is the explorer, the adventurer. And that's certainly my position today -- it's what's driven me since I was a child. I want to explore, I want to see something new. Well, I've been in space...five times before, this is my sixth flight; I have seen many, many things from space, and they were wonderful; I want to see more, I'm hooked. So, I am a little bit of an addict for spaceflight...That's what's driving me personally. "But, on the other side of it you have to say, what does my wife think? What does the manager who's responsible for our lives think? What does the President of the United States think about sending, you know, our people into space? And those are different decisions, different comments and values. And to that extent, you have to balance risk versus what you think you're getting back from this adventure." Kaleri, having accumulated more than a year living above the planet, says someone must explore space and he is the man for that job. "Since we've started flying into space, I believe nothing can stop us: it is in the nature of the human being that, whatever happens, we will go to extremes to reach our goals. This is the same situation here," he said. "And we are not risking our lives just because of our ambition or pleasure or whatnot; we are professionals, and we understand the full extent of the risk we are taking. We understand it is not done just for us; it is done, the whole project exists, for the humankind, for our friends, for our relatives, for everybody on this planet. Somebody must do this work; we are the professionals, so we have to do it." Foale, 46, is married with two children. Born in England, he moved to Houston after college seeking a career in the space program. He began working at NASA with a behind-the-scenes job 20 years ago. Four years later, he was selected as an astronaut. In 1992, he rocketed into space for the first time aboard shuttle Atlantis on an atmospheric science flight. He flew a repeat mission the next year. Flying aboard Discovery in 1995, he was on the first rendezvous between the shuttle and Russian space station Mir. In 1997, he was launched to Mir for a four-and-a-half-month stay, during which the infamous collision by the Progress cargo freighter occurred, damaging the station. In late 1999, he served as a spacewalker on the third Hubble Space Telescope servicing mission. With one lengthy stay in space on his list of accomplishments, Foale is ready for another. "Certainly any long-duration flight helps an astronaut prepare for another one, and the most anxiety I had before my Mir flight was just wondering about how I, Michael Foale, will manage to live in a small place for four or five months with two other people; I had no idea what the result would be," he said. "Now I am faced with possibly a six-, seven-month mission with one other person, but I am absolutely sure that Michael Foale anyway can handle it, if nothing really changes compared to the last mission, which was quite hard actually on Mir. So, it's prepared me greatly in confidence, in self-confidence. "I know that there's nothing out there that is really insurmountable. I know that there may be difficulties, but, in a kind of step-by-step, get up the morning, look at what's to be done that day, and go to bed and get some rest, and do it again the next day -- with that kind of approach you can get through any long mission, and certainly that's how I'm applying myself to this new experience." Foale has logged 178 days in space during five flights and performed three spacewalks totaling 18 hours and 49 minutes. If all goes well, the planned 194-day duration of Expedition 8 will give Foale a career total of 372 days off the planet. Kaleri, 47, is married with one child. He was born in Latvia. Selected as a cosmonaut candidate in 1984, Kaleri completed basic training and evaluation at the Gagarin Cosmonaut Training Center. At a young age, Kaleri knew he wanted to fly in space. "When I was a kid it was a dream, my dream," he recalls. "And I entered the institute, in Moscow, and my first specialty was aerospace engineering, and after graduation I entered in the design bureau, now it is called Rocket and Space Corporation Energia, it was the main design bureau in manned space programs in Russia. So, it was straight way to the cosmonauts and, then, I decided, why not? I can try it." 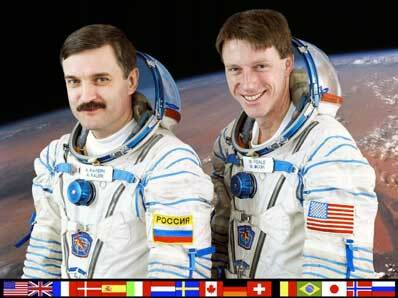 His first voyage was a 145-day flight to the space station Mir in 1992. 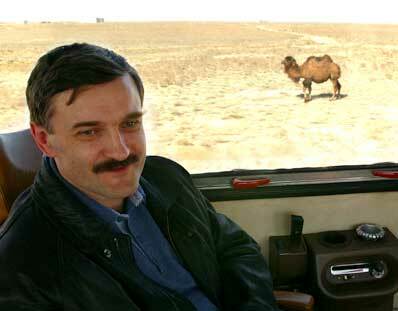 He followed up the mission with a 197-day flight to Mir in 1996-1997. 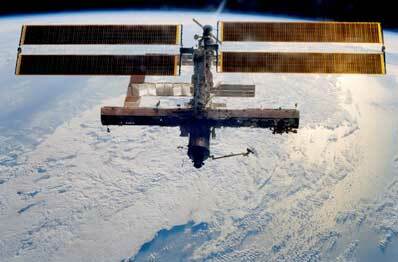 His most recent spaceflight, in 2000, spent over two months at Mir preparing it for reentry. Kaleri has logged a total of 416 days in space and four spacewalks. Assuming a full-duration Expedition 8 mission, Kaleri's career time will be increased to 610 days, putting him fifth on the all-time spaceflight list. Duque, 40, is married with three children. 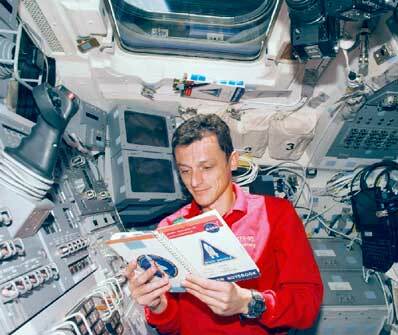 Born in Madrid, he was selected to join the European Space Agency's astronaut group in 1992. 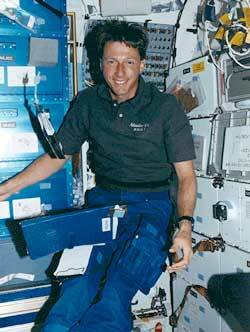 A veteran of one spaceflight lasting nine days, Duque flew aboard shuttle Discovery in 1998 to conduct a host of science experiments. That mission is remembered as the one featuring John Glenn's return to space. Duque's upcoming mission begins with sharing the Soyuz launch with Expedition 8 and then catching a ride back to Earth with Expedition 7. In between, he will perform a series of experiments for Europe while on the station. "The goals are multiple, as we normally have on these spaceflights, because spaceflight is a dangerous and expensive issue, and you have to use every minute. We have the goal of, first, replacing the Soyuz that is up there and has, which has reached the end of its guaranteed lifetime," Duque said. "In the time that it takes to exchange the crews then I take the opportunity for eight days to use the space station as a laboratory with some experiences and other activities that have been waiting in the queue of the European Space Agency for so long for the launch of the Columbus module." Duque added that while shuttles are grounded, further delaying the Columbus module's delivery to the station by a few more years, it is necessary for the Europeans to remain a participant in station missions. "It is important to keep the experimental teams working and to give them opportunities to already obtain some results from the space station." Duque gained his seat in the Soyuz as part of a contract between the European Space Agency and Rosaviakosmos, the Russian Aviation and Space Agency.